Am I the only one who doesn't really like this whole Food & Wine thing? My friends and I have been to WDW during Food & Wine 4 or 5 times (for a completely unrelated event that happens to fall in that time period) and after wandering around EPCOT for a little while and deciding it would cost us $60 to get enough bites of mediocre food to make it worthwhile, we end up leaving and going someplace else. About the only thing we DO get is a beer, but even then we'll usually just go to Rose & Crown. indyjones wrote: Am I the only one who doesn't really like this whole Food & Wine thing? I love it, and I go nearly every year. ^ I agree with you Chuck, although I wish that I could go every year like you, Robb/Elissa and others. The trip reports that you all do helps a little with the sting of that though. I seem to recall having only one or two things at F&W that I may have considered mediocre, but the majority of the samples that I have had have been either really good or just downright delicious. I have had nothing that I would say is nasty or uneatable. As a person that has been to his share of food festivals, my advice for the poster that stated the food at F&W mediocre, you might just want to stay away from your hometown's food festivals - now some of THOSE can be great, to mediocre, to downright terrible! My strategy for Food and Wine is to eat at least one real meal at one of the Quick Service locations in addition to some of the smaller bites. Especially since each plate seems to go up by 1 dollar+ every year now in addition to shrinking. It's a surprisingly expensive experience otherwise, at least 50 per person before alcohol. And I can eat at the Japanese or Moroccan pavilion anytime. The food is definitely very very good on average. Yes. Now please go away and take your negativity to some other forum. Thanks. Last edited by robbalvey on Wed Sep 06, 2017 3:40 pm. I think that Michael and I blew through about $250 on food and booze when we went...but I wanted to make sure that I had a sample of alcohol from every country so I could say that I drank my way around the world - we had a freaking blast. Now do the alcohol samples in each country during F&W count, or do you unofficially have to have a full alcoholic beverage at every permanent country for it to qualify? Given that there are a lot of other countries represented at the food festivals, I know that I had a really good buzz going on by the time Illumigaytions started. Philrad71 wrote: I think that Michael and I blew through about $250 on food and booze when we went...but I wanted to make sure that I had a sample of alcohol from every country so I could say that I drank my way around the world - we had a freaking blast. I'm not THAT much of a drinker, but hell yes, I'd be trying "one of everything" from every booth. so I expect our cost the one time we went to a similar festival was close, if not as much as yours. and it looked perfect for carrying food and beverages with one hand, from the various kiosks at The Festival. And, do they have a (let's say) 4 oz. Festival Beverage Cup (for reuse when sampling different wines and beers, etc.) in the Festival? of it. Then the cup could be refilled, etc. My 4oz. 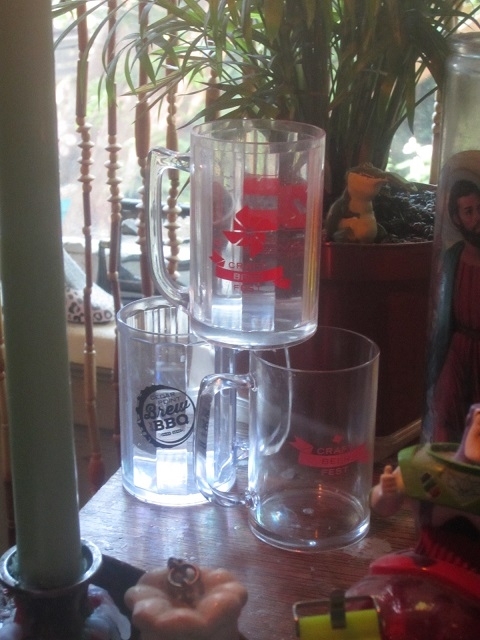 reusable cups, from B&B in CP, and the Beer Fest at The PNE in vancouver. They do! They've had it for a number of years now and I'm pretty sure it's become a staple of the event. Nrthwnd wrote: And, do they have a (let's say) 4 oz. Festival Beverage Cup (for reuse when sampling different wines and beers, etc.) in the Festival? They don't because it's not like an equal amount at each place. And it's less like a "sample" and more like a "small drink" and those drink cups can come in all different shapes and sizes depending on what you get. So I think it makes more sense that way. ^ Cool. Good to know, thanks Robb!